Since it’s Halloween, most of us are dressing up and probably using some type of face makeup. Follow these simple guidelines to ensure your makeup lasts and your skin stays protected! 1) Use a primer before painting your face to provide a barrier between your skin and the makeup- this way, the makeup sits on top of your primer instead of directly on the skin. 2) Remove all makeup after your event is done! 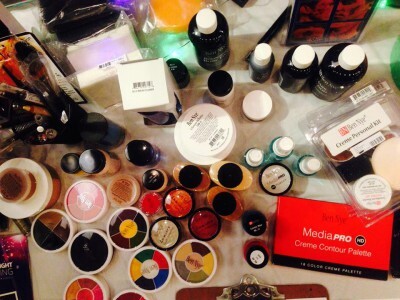 Sleeping in stage makeup that is loaded with heavy waxes, colors and oils is a recipe for breakouts and irritation. If possible, use an oil-based cleanser to help dissolve makeup so that there is minimal rubbing, tugging, and pulling. Milk/cream cleansers can work just as well or use makeup wipes as another option. Follow with your cleanser to remove any leftover residue and moisturize. 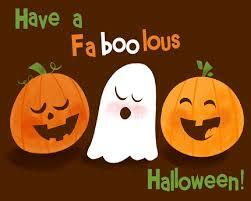 Thanks for reading, have a fun Halloween weekend, and stay tuned next week! Hi everyone! With October ending this week, I’m sharing products I’ve been using religiously this month. Let’s get to it! Nordstrom just opened up locally and when I saw they carried Nest Candles in store, I knew I had to pick this up. With exotic notes of Moroccan Amber, Star Anise, Sweet Patchouli, Bergamot and Eucalyptus, this candle is just what you need to create a zen environment. I received this NYX Butter Gloss in a Target Beauty Box and I must say it was love at first swipe. It’s described as a fuchsia but has a sheer finish that on my lips looks natural with a slight tinge of pink. Great for everyday minimal looks or to top off lipsticks without competing with the shade underneath. I had a chemical peel about 2 weeks ago and this was instrumental in keeping my skin hydrated. It’s an oil-free, water based serum of hyaluronic acid that helps attract and retain moisture in your skin. Perfect for my combination skin as it delivers hydration without making me breakout. 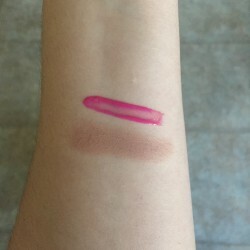 I know I’ve mentioned this blush before but it’s for good reason. It’s an absolute staple in my makeup arsenal because it is versatile and is a joy to use with its smooth and buttery consistency. Pairs well with natural or vampy fall looks. You need this blush. Trust. 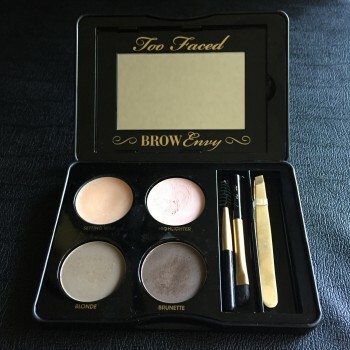 Too Faced Brow Envy Kit Review! Happy Tuesday everyone! I hope you all had a good weekend. 🙂 Can you believe we’re that much closer to a new month? Crazy. 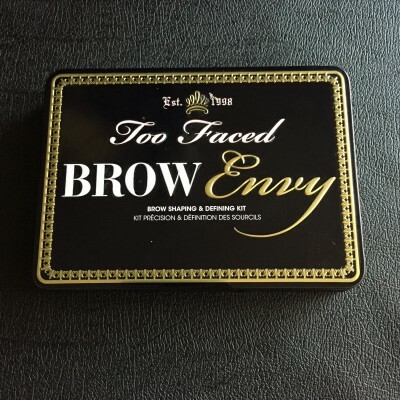 I finally have the review for the Too Faced Brow envy Brow Shaping and Defining Kit so let’s get started. The kit comes housed in a black compact, complete with a mirror, setting wax, a cream highlight shade, brow powder duos, tweezers, a spooley, brush and angled brush. A close up picture. 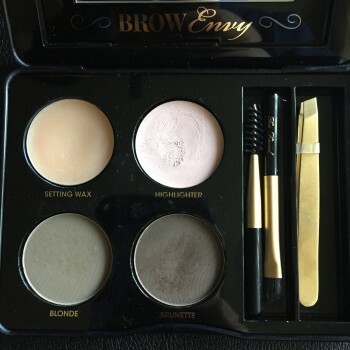 The bottom left powder is Blonde while the bottom right powder is brunette. 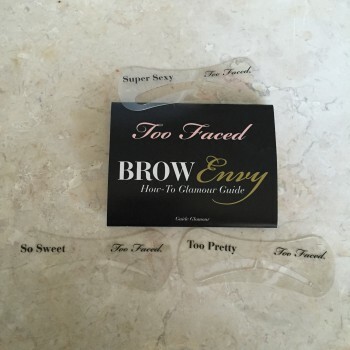 Also included in this kit are three eyebrow stencils and a Glamour Guide detailing how to use the kit. 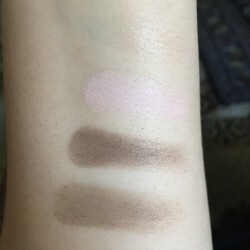 Swatches of the shades. You can’t really see the setting wax too well because it’s clear but it’s sitting on top of the pale pink highlight shade. Overall: I really do like this kit and it has pretty much all of the necessary tools to keep your eyebrows shaped and defined. Personally, I would have preferred a powder highlight instead of a cream one just because I feel I can control it better. Also, the stencils won’t be used because a) they don’t fit my eyebrow shape and b) my eyebrows are pretty wild so I have to get them threaded about every month. The eyebrow brush is a little stiffer than I would like but it’s not a deal breaker. I would recommend this kit to anyone who has dark eyebrows but if you’re looking for lighter shades, Anastasia has a really great selection of powder duos as well. 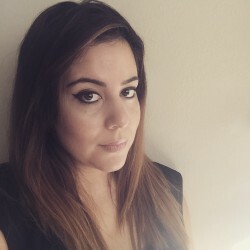 A picture of me over the weekend using this brow kit. What’s your favorite product to keep your brows on point? 3 Important Tips for Halloween Makeup ! With Halloween near, some of you may don to wear elaborate makeup for parties and why not? Heck, one of my favorite costumes was when I dressed up as a Homecoming Zombie Queen, complete with blood and gore. So. Much. Fun. Here’s a few tips and tricks to ensure that the horror factor lasts only one night and doesn’t come back to haunt you days later…. ALWAYS conduct a patch test when trying out makeup, especially Halloween makeup as there are many pigments and colors (red and blue) that can be irritating to the skin and cause an allergic reaction. Prosthetics may or may not contain latex so make sure to ask questions about what is being used. Also, if you’re going to use false lashes, keep in mind that many have adverse reactions to the adhesive so tread with caution and to be safe, ask for a P.D. test to be performed. Applying a primer on the skin not only keeps makeup lasting longer but it also creates a barrier between the skin, allowing makeup to sit on top of that instead of the skin. Facilitate the removal of makeup by using oil-based makeup wipes. A personal favorite is Dermalogica PreCleanse Wipes which makes removing false eyelashes or stubborn makeup easier and doesn’t require harsh pulling or tugging of the skin. Follow up with your cleanser afterwards to thoroughly remove any heavy, thick layers of makeup that can clog pores and contribute to acne. Have something fun planned for Halloween? Let me know in the comments below! 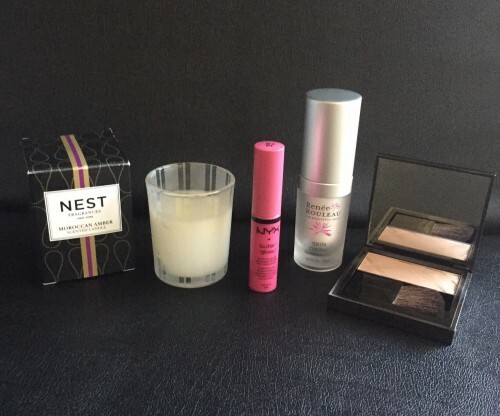 PopSugar Must Have Unboxing October 2015! Disclaimer: This post contains a referral link. Hi everyone! How was your weekend? 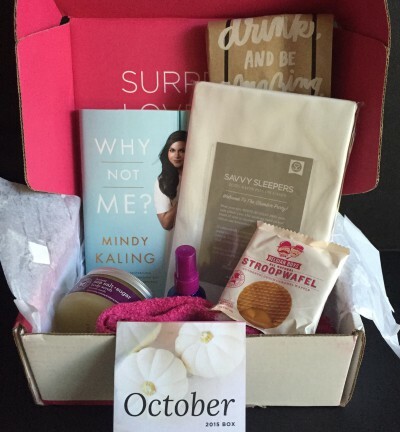 October’s PopSugar Must Have Box arrived over the weekend, prompting a great start. 🙂 Take a peek at what was included in this month’s box! Inspiration behind this months box. The second item I tried after taking pictures and this was heavenly! It’s a caramel-filled waffle that’s a nice treat without being overly sweet. Definitely not something I would have ever thought to purchase, these imaged paper bags can be used to carry your favorite bottle of wine to any special occasion. This 100% satin pillowcase “prevents sleep wrinkles, reduces hair breakage, and protects salon blowouts for the ultimate sleep experience.” I do notice that sometimes I wake up with these creases on the side of my face with my regular pillowcases and since switching to this, they seem less pronounced. More time will tell. These pink slipper socks were designed by PopSugar to support Breast Cancer Awareness month. “Richer Poorer proudly supports the fight against breast cancer and the important work of Right Action for Women.” These will come in handy once things start cooling down over here but for now, these will be put away as the sight of them causes me to cringe with this hot weather. Another special extra, this $40 gift card can be used to receive your own monogrammed statement piece. 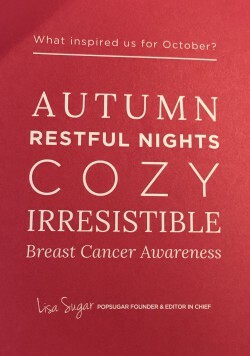 Also included were coupon codes: 20% off Savvy Sleepers and 30% off products purchased online from The Honest Company. 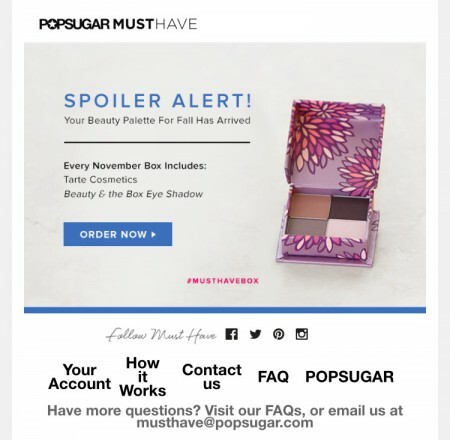 If you’re interested in trying out PopSugar Must Have, click here and if you need an incentive, check out this sneak peek of what’s included in every November PopSugar Must Have Box. Skin Tip: Skin Cancer Reminder! Today’s skin tip hits close to home as my grandfather recently discovered he has skin cancer on his ear. Thank God it was caught on time but it serves as a reminder that we need to make sure we are covering all our exposed areas when applying sunscreen. Our ears and the tops of our feet are commonly forgotten places but areas where skin cancer can develop. It’s also a good reminder to have yearly checkups with a dermatologist for safety measures. Wishing you a safe weekend!